This week, we were delighted to be joined by 40 students from the Ravensburg Media & Design School, DHBW. Erasmus-supported Teaching Fellow, Sara Chapman and 5 third year students from the University of Reading were fortunate enough to visit the medieval town of Ravensburg in Germany for 5 days and compete with the DHBW students in the D&AD New Blood Awards. The competition involved a series of briefs that groups of students could choose from. It was extremely interesting to see how students from a different University approach client briefs and present their pitches. Here at the University of Reading, knowing how to approach a brief and present a client facing pitch effectively is an essential skill. Sessional lecturer Rachel Warner kicked off the beginning of this Baseline shift session by giving some insight on how to approach briefs. She began by stating that ‘the answer is usually within the brief’. In order to find this answer, there are a number of key steps that need following. The first step is to ‘break it down’. Rachel suggested narrowing the title down to two words as this helps designers have a clear idea of what the brief is actually asking them to do. Former New Blood Award winner Robyn Frost says “Get to know your brief … cut up, rearrange and write all over them.” The second step is challenging your brief and questioning what your client needs. This is where as designers, we establish a relationship with our client. We can then look at what has been done before and who the competitors are as well as identifying who the brief is targeting. Once this key information has been conducted, the next stage would be to test out our ideas on the user and seek feedback. This will help understand what your client is trying to achieve and what success looks like. This technique was eyeopening for us students and helped us understand the structure of how to approach a brief effectively. After this informative introduction, 15 groups of 2 or 3 students presented their work. They were all extremely professional and confident when showcasing their pitches. The first few presentations addressed the ‘Monotype’ brief where students were asked to come up with their own typeface. Each group had a different theme to their typeface, most of which were quite controversial and thought provoking. The first was ‘Loneliness and big cities’, the second was looking at the connection between Brexit and the Colonisation of Mars and the last targeted the theme of “Young people and politics”. All three approaches were interesting as each group focused on different aspects of designing a typeface. The first team looked at how type is translated to different languages and alphabets such as the Hindi and Senegalese alphabets. The second group talked about the visual aspects of a typeface and how integrating colour and texture can impact a design. The last group focused on the meaning behind a typeface and they also looked at showing strong visual messages through symbols and iconography. Students also presented work for an Adidas brief. One group aimed their design at Girls aged 14–17. They carried out a survey where they found out why girls of this age were quitting sports. There were a number of different reasons including equipment being too expensive, lack of confidence in their abilities, accessibility (as there are more sport teams for men than for women), not enough time and, lastly, the fear of being judged by society for taking part in what some may brand as a ‘manly’ activity. With this research in mind, this group developed a campaign called “upstart” where they promoted the brand on social media and made an app that encouraged young girls to get involved. The app offered games that would allow girls to get points and eventually win Adidas merchandise. This groups presentation was really insightful as it showed how they used user testing for their research and this helped them build on their design. Overall, the presentations were extremely insightful and helpful for us students at Reading to understand that there is more than one way to approach a brief. Watching the presentations, it was helpful to here the feedback that other students gave as well as how the presenting students answered questions. It allowed all students from both universities to engage in an interesting discussion about briefs and how to go about them. Presentation by 3 of the Ravensburg students. After the presentations, it was fascinating to talk to some of the students from Reading who had been to Ravensburg. They all seemed extremely grateful to have been able to embark on this adventure and they also mentioned how much it has helped them grow as designers. Their favourite parts of the experience included experiencing a new town and culture, seeing how a different university works, working on the D&AD brief and, lastly, working in a different studio environment. The team from Reading explained that they were impressed by the huge number of ideas put forward by Ravensburg students before deciding which one to take forward. This really encouraged the Reading students to divert more energy to the ideation phase, rather than focussing on later refinements. 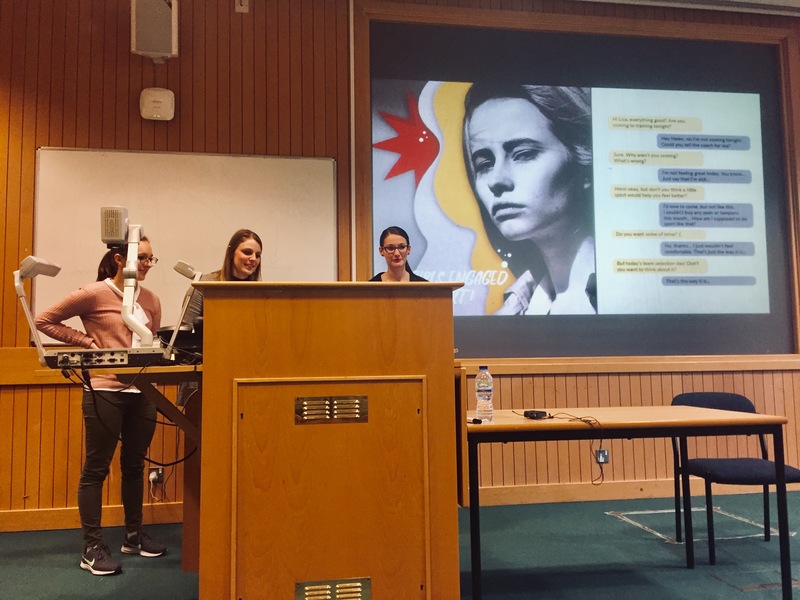 They were also inspired by the students at Ravensburg’s organisation and how they structured their client facing pitches in an enticing and story-telling manner. 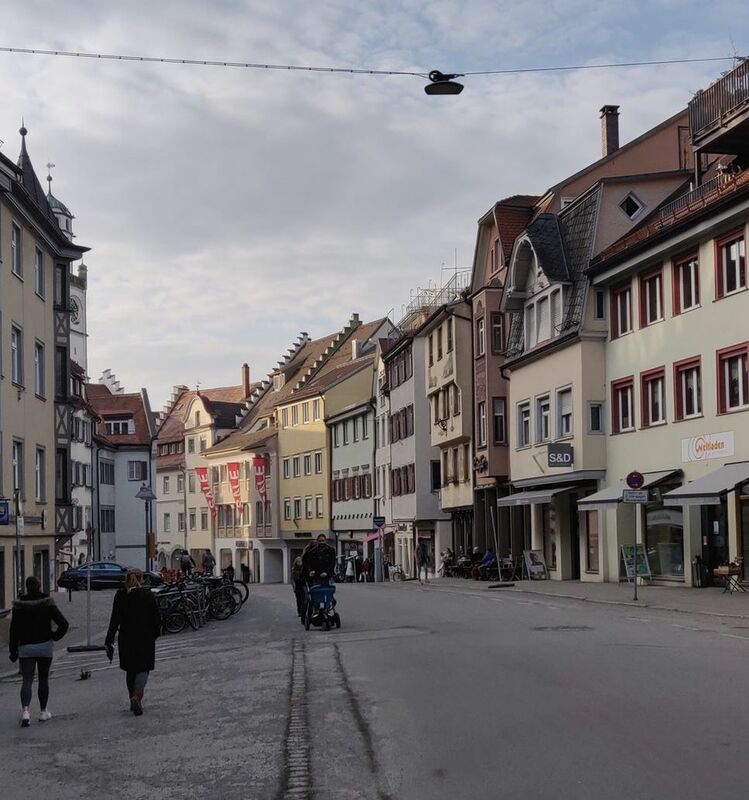 Part 3’s Abigail Hammond’s photo of the typical streets of Ravensburg. The Part 3s that took part in the D&AD awards are not the only lucky students that have been able to experience the beautiful medieval town of Ravensburg. 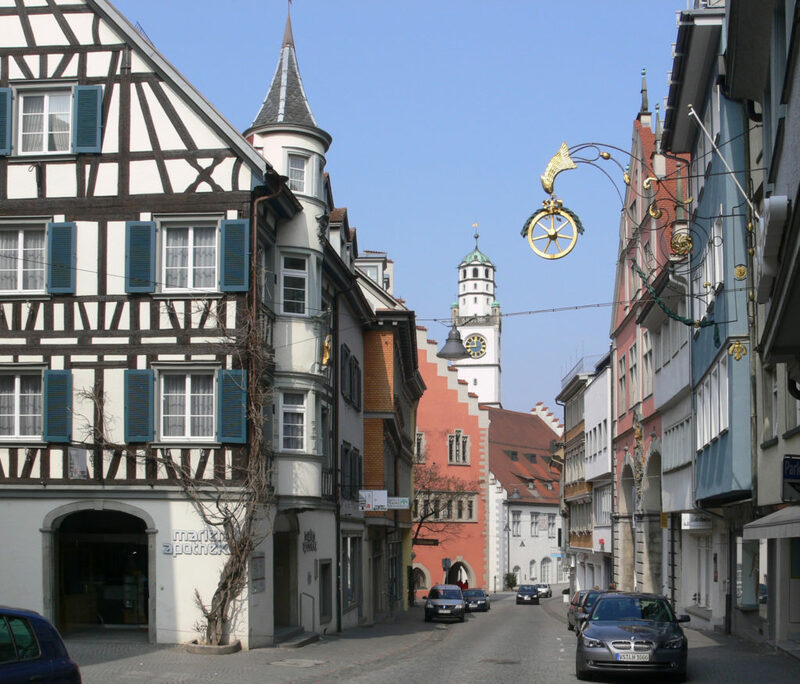 3 of our second year students are currently in Ravensburg on the study abroad programme for 3 months. They have been working on app and website projects as well as the D&AD competition. They have been integrating with the German culture and made many friends on this course. As well as working hard, these 3 students have been partaking in outdoor activities and excursions visiting the gothic castles in Ravensburg and the beautiful mountains in the outskirts. Part 2 students, joined by the other ‘study abroad’ students, enjoying their stay in Ravensburg. 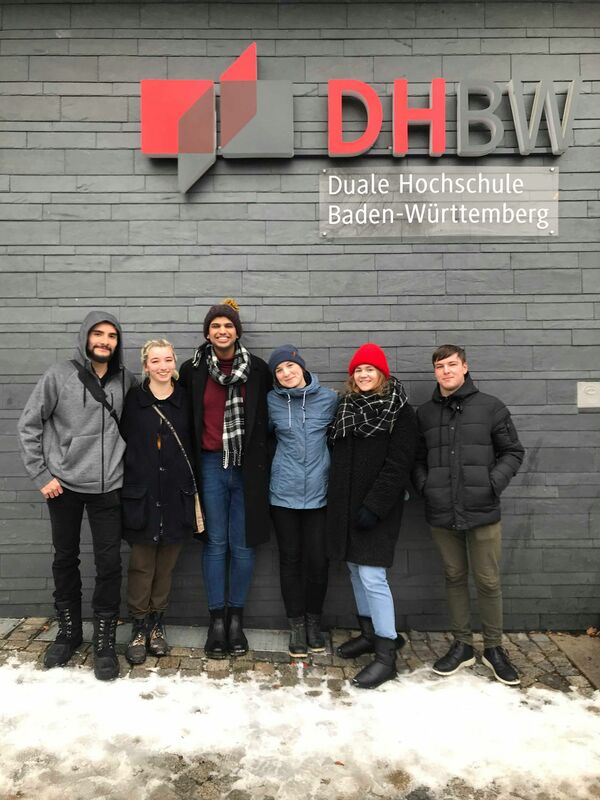 Overall, we would like to thank the DHBW University in Ravensburg for the amazing experience that the students from our university have been able to get involved in. We were also extremely grateful for all the students from Ravensburg who came all the way to Reading to showcase their work and have interesting discussions on graphic design and how to meet the clients needs when approaching a brief.